For his fourth collection, Edward Mackinnon sets himself a grim and morally serious task: to chart the incessancy of global warfare from World War 2 through to the present, i.e. roughly three-quarters of the time period covered by Bloodaxe’s 600-page Hundred Years’ War anthology, published in 2014 (a book that Mackinnon is absent from even though his earlier collections Heartland Germany and Killing Time in Arcadia would have yielded up excellent contributions). It hardly needs saying that The Storm Called Progress is considerably shorter than The Hundred Years’ War. Clocking in at 52 pages, of which six constitute illustrative material, the collection divides into four sections – Post-War, 1960s and 70s, 1980s and 90s, The New Millennium – and an epilogue. The illustrations range from family snaps through the kennardphillips satirical Tony Blair selfie montage “Photo Op” to a photograph of Palestinian artist Iyad Sabbah’s chilling sculpture “Worn Out”. 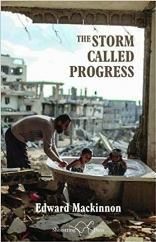 The work of another Palestinian, photographer Emad Nassar, adorns the cover. Unlike the angel, Mackinnon’s poems are fixed in time. “Photo Album” prefaces the Post-War section and effectively sets out the collection’s modus operandi by locating catastrophic global events within the specifics of the poet’s personal history. there was no such thing as society. worked in a munitions factory. How else would Mum and Dad have met? The economy of these lines is immediate. The straight talk. The distillation. A statement of intent: throughout, Mackinnon’s style is direct and no punches are pulled. The Thatcher reference sets the first stanza jangling. It’s a bitter contrast: a society temporarily rendered classless by the blitz spirit of a nation pulling together (something evoked ad nauseum by the proponents of a hard Brexit) and the demonisation of society, and by extension socialism, forty years later in the name of the free market, yuppie-ism and the all-encompassing Thatcherite dogma of self-interest. The dictator’s now selling oil for euros. That’s a fact. And the dollar’s angry. So, it’s oil, is it? So, it’s weapons (WMDs), is it? So, it’s a regime change, is it? So, it’s Sept 11, is it? a Kalahari bushman inquired of a Westerner: Is he guilty, OJ? The title of this piece is “Sometime in the 1990s the Information Age Begins”. Mackinnon is sometimes so arch that his titles almost negate the requirement of a poem beneath them. At other times, though, such as in “A Grey-Haired Little Lady” – a succinct recollection of meeting CPGB leading light Margot Heinemann (referencing a poem by John Cornfield) – or “When You Died”, a brutally honest dissection of the familial divisions and power plays in evidence at his father’s funeral, the title is a merely a placeholder and the poem itself hits home like a sucker punch. Such can be said of the collection as a whole. Yes, it’s political. Yes, it’s indignant, angry, and has an axe to grind. But Mackinnon never loses sight of the personal. “Questions” employs the breathless onrush of a child’s demand for answers to highlight the unthinking brutality of the adult world. “Caption Without Photo” flips the sacrosanctity of the family unit on its head and reverse-engineers the schisms and conflicts of that selfsame adult world to the terrifyingly vulnerable mindscape of childhood. Mackinnon’s own childhood is so inescapably mapped onto the psychological fall-out of World War 2 – a conflict that lurched into the Cold War via the war in Korea and the fall of French imperialism in Indochina telegraphed by Diap’s triumph at Dienbienphu – that “The Storm Called Progress” was probably inevitable. Mackinnon has lived through the wars and lies and dirty politics of much of the twentieth century and the twenty-first’s ignominious showing thus far. And he kicks against it, challenging the policy-makers at fault and hymning the memories of those crushed by the war machine. He is the poet our bartered and divided age is crying out for.